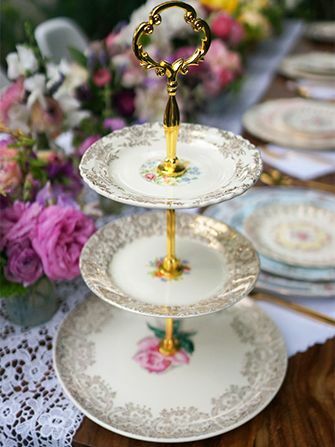 A tiered cake stand adds such an elegant touch to a tea party! It’s actually not that difficult to make your own tiered cake stand, and you can save loads of money and create a unique look by making your own. You can choose to use mis-matched plates for a fun look, or if you’d prefer all your plates can match. Check eBay or your local flea market for inexpensive plates. You’ll need to feel comfortable with a power drill (although I’m tempted to try this with some sort of super-duper adhesive), 3 plates, and a cake stand hardware set (which you can find very reasonably priced at Amazon). Check out the complete directions at Refinery 29.